I just visited the greenhouse and harvested mustard greens, kohlrabi, lettuce and arugula. It was beautiful there today, warm and sunny and the nasturtiums are blooming. The produce looks healthy and lush and shows no signs of stress from the frigid air that has hit us the last few weeks. I got my electric bill and it said the average temperature from November 20 to December 20 was 39 degrees. That was 6 degrees lower than last December. The days are longer and I just saw the beginnings of blossoms on the broccoli raab. We are growing an overwinter variety and I’m not sure whether the cold or the longer days have triggered the buds. We are also trying a purple sprouting broccoli this year. It also winters over and we should have some small purple heads in the spring. Right now there is plenty to pick including swiss chard and kale. These seem to be favorites. We have started new lettuce seedlings and there is red romaine and butterhead to be picked. 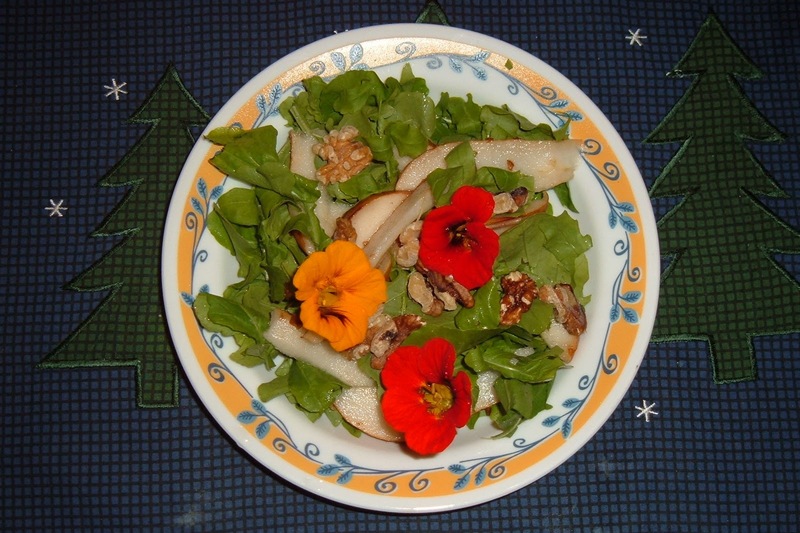 The salad shown is baby arugula, pear, and walnut. The nasturtiums are edible and slightly spicy. Enjoy! The annual Christmas party was at the Admiral Benbow Inn in Oak Bluffs. It was a great success. The present swap was as silly as ever and Betsy brought the cocoa she succeeded in securing to our membership meeting in mid December. We are calling the new fund to reglaze the greenhouse the Top Hat fund. Happy New Year!! May 2011 be as green as this year.